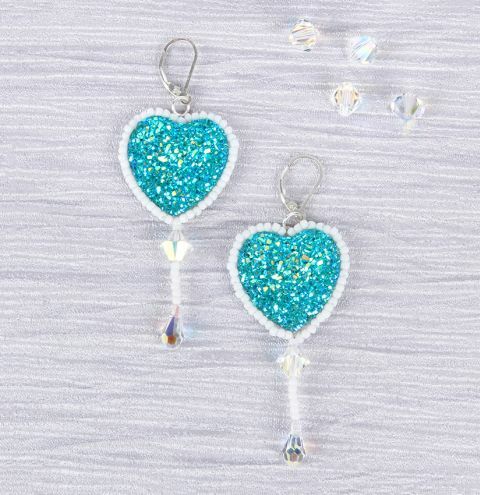 Learn how to make the Mermaid Earrings using sparkling heart shaped cabochons and beautiful Swarovski beads and charms. Lightly draw around your heart cabochon on your white beading foundation. Cut out the heart shape, adding approx 1.5mm to the outside of the line you drew. This will be where the seed beads will sit. The seed beads should sit slightly over the edge of the foundation. Try positioning your cabochon on the foundation and positioning a seed bead on the edge to see if any foundation sticks out from under it. Once you are happy with this, glue your cabochon down onto the foundation heart shape. Repeat this for a second heart cabochon for your other earring. You will require a thin beading needle that is small enough to pass through your seed beads. Start sewing your seed beads around the edge of your heart cabochon. After every 3 seed beads, pass through the foundation, come back up before the last seed bead you added. Thread through this bead again and add 3 more. Continue this around your design. Secure your beads further by going around the heart a second time. Exit the beads through the lowest seed bead at the bottom point of the heart. Thread through a Swarovski bicone, 6 seed beads and thread through the hole on one of your Swarovski droplets. Pass back up through all of the beads and back through into the seed beads around your heart. Secure your thread and tail within your design. Finally, attach your earring to a jumpring. Make sure the jumpring is closed properly and sew it to the centre at the top of the heart. You can pass this thread into your design to secure it further. Add a drop of glue to any sections you want to secure more before wearing, such as knots.